5 Star Rating and Feedback system for live chat. Getting feedback from your users can be one of the most important aspects of dealing with them. If your users are not happy, you need to know and be able to act on it! 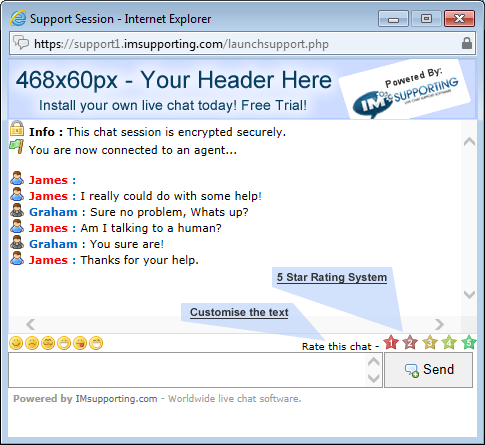 With the IMsupporting live chat software, we incorporate a simple 5 star rating and feedback system for you to use within your live chats. Its easy to configure and ultra fast to enable. Once enabled, your visitors will be given the option to rate the chat they are having with you at any time. You can then at a later date look at your reports and view just how happy your visitors are and re-engage with users if they need to be contacted.